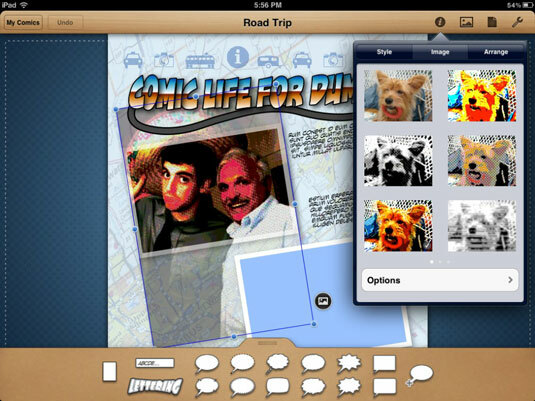 Comic Life iPad app allows younger students to explore creative storytelling by creating comics. After using Comic Life iPad app to stretch students’ imagination and language skills, you can help them share their creations in a variety of ways. All your comics can be browsed in the My Comics view. If you’re editing your comic, just tap the My Comics button on the top left to go to My Comics. 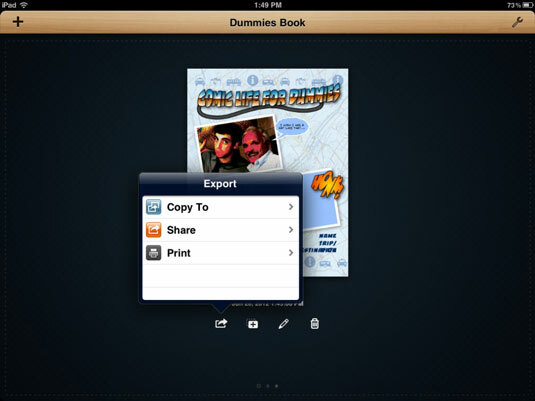 Copy To: Select this option to see a variety of options to copy your comic off your iPad. Your options include exporting to your iTunes library or to a Dropbox account or WebDAV server if you have either. Share: Tap the Share option on the menu, and you’ll see options to share your comic on your Facebook or Twitter account (provided that you have either), send it via e-mail, or save it to your Photo Library. Print: Tap the Print option on the menu, and select your printer to print your comic. Tap the Settings icon (wrench) in the top-right corner of the My Comics view screen, and select Open In Trays from the menu. Any In Trays that are open for receiving comics on nearby iPads will be displayed. Select a destination In Tray. The In Tray will slide down to the bottom of the screen, enabling you to choose comics from your collections. Tap and drag any of your comics down to the destination In Tray. A progress meter will appear as the comic is copied.